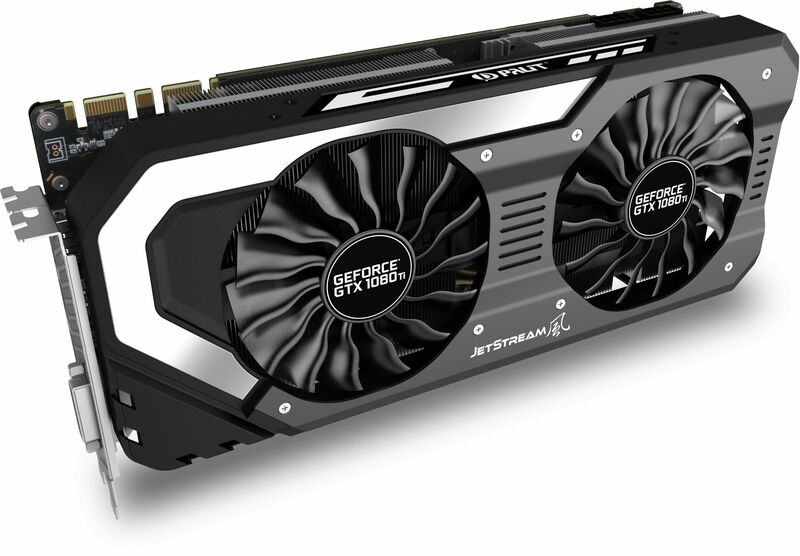 The GeForce GTX 1080 Ti is the world's most advanced GPU. Powered by next-generation NVIDIA Pascal architecture, it delivers incredible performance, unmatched power efficiency, and cutting-edge features. 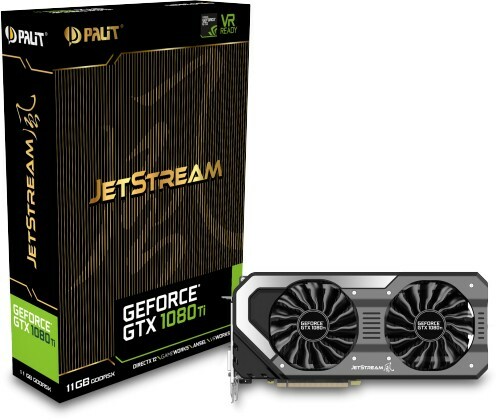 The revolutionary Palit JetStream GeForce GTX 1080 Ti graphics card features advanced innovative cooling and an optimised product design to deliver the ultimate gaming performance. 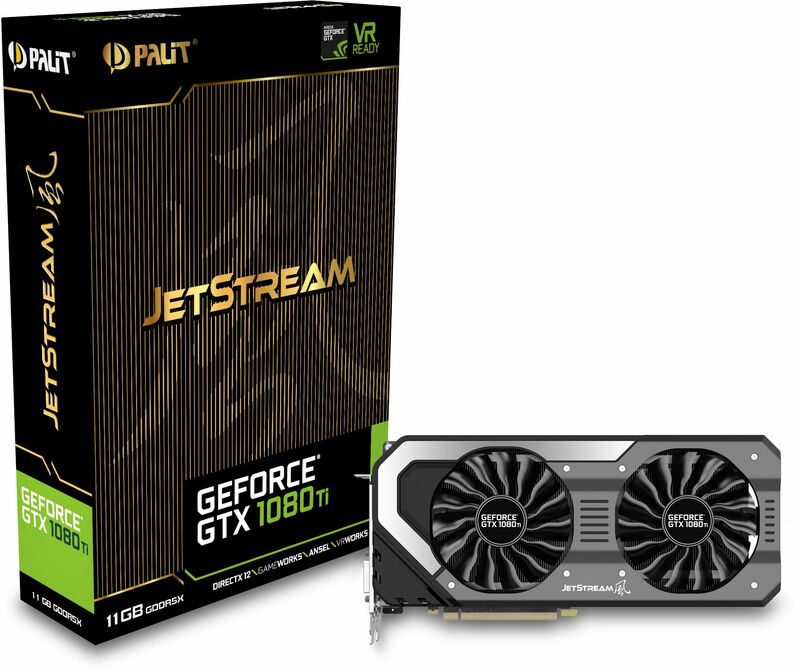 As the latest and the next generation NVIDIA Pascal architecture features power efficiency, gaming experiences and latest gaming technologies, the Palit GeForce GTX 1080 Ti JetStream series guarantee gamers cutting-edge performance and a explosive new gaming experience. The colour lighting from RGB LED can be changed in accordance with graphics temperature. The temperature can easily be identified by different colors from the external appearance of the graphics card. Gamers can choose from 16.8 million colors to suit their own style and preferences. The LED Lighting effects can be controlled by the ThunderMaster Utility. Keep Silent while you are experiencing multimedia application and general workload. The operating fans only rotate while working on heavier loading programs such as gaming and that will happen only if the GPU temperature surpasses 60°C. A Dual Fan design offers double the cooling performance and combined with the two 10cm Smart Fans, heat is effectively drawn away from hot spots. Inspired by the power of jet engines, the TurboFan Blade is designed to improve cooling performance by generating a powerful air stream and air pressure, while keeping noise to a minimum. The design of the honeycomb bracket increases airflow by up to 15%, allowing the heat generated from GPU to be exhausted via the honeycomb design bracket. This enables more efficient cooling. Unique 8-Phase PWM design reduces max current load for each phase to stabilise the voltage level and improve overclocking ability. It also provides another 30% current capacity. With its three DisplayPort ports, the Palit provides a flawless, jaw dropping experience with three 4K monitors setup in surround. The 10cm Smart Fan system consists of dual fans with alternating blade rotations. Each adjacent fan rotates in a different direction to reduce airflow conflicts and effectively improve overall cooling performance. DrMOS, originally only available for high-end server CPUs, is now available in all its glory in the next generation of Palit graphics cards. DrMOS offers high current circuits, low noise operation and effective reduction of heat generating. The new JetStream design adding large size copper base directly adhered with GPU and more heatpipes; that can efficiently dissipate the heat from GPU and make 22% cooler compared to an aluminium base.